Posted on April 18, 2014 by John Daniel Begg under Society, Via Dolorosa. Pilate washing his hands of Jesus. His beautiful sadness begins. A beautiful sadness is today, Good Friday. Jesus has died for us today, but He also has given us a way to be happy with Him in The New Garden for all eternity. In which we leave the sadness of this earth and enter forever into perfection with Him. Life upon this earth is filled with complex vexation. Life in the New Garden will be the most simple of perfection. He who saw this has testified so that you also may believe. His testimony is true, and he knows that he tells the truth. These things occurred so that the Scripture might be fulfilled: “None of his bones shall be broken”. And again another passage of Scripture says: “They will look on the one whom they have pierced” (Jn 19:35-37). and let yourself be crucified without complaint. with which you wanted to fill our hearts. when God’s gracious love is revealed. the path to the redemption of all our sorrows. who stood faithfully beneath that gibbet. who this day, thanks to you, enters paradise. a cry of life for all humanity. open unto us the doors of undying Life! Amen. Pilate, wanting to release Jesus, addressed them again; but they kept shouting: “Crucify him, crucify him!” A third time he said to them: “Why, what evil has he done? I have found in him no ground for the sentence of death; I will therefore have him flogged and then release him”. But they kept urgently demanding with loud shouts that he should be crucified; and their voices prevailed. So Pilate gave his verdict that their demand should be granted. He released the man they asked for, the one who had been put in prison for insurrection and murder, and he handed Jesus over as they wished (Lk 23:21-25). Pilate, timid and afraid of the truth, fingers pointed in accusation, and the growing clamour of the raging crowd: these are the first stages in Jesus’ death. Innocent, like a lamb, whose blood saves his people. Jesus, who walked among us bringing healing and blessing, is now sentenced to capital punishment. Not a word of gratitude from the crowd, which instead chooses Barabbas. For Pilate, the case is an embarrassment. He hands it over to the crowd and washes his hands of it, concerned only for his own power. He delivers Jesus to be crucified. He wants to know nothing more of him. For Pilate, the case is closed. Jesus’ hasty condemnation thus embraces the easy accusations, the superficial judgements of the crowd, the insinuations and the prejudices which harden hearts and create a culture of racism and exclusion, a throw-away culture of anonymous letters and vicious slanders. Once we are accused, our name is immediately splayed across the front page; once acquitted, it ends up on the last! And what about us? Will we have a clear, upright and responsible conscience, one which never forsakes the innocent but courageously takes the side of the weak, resisting injustice and defending truth whenever it is violated? there are hands which give support and hands which sign wrongful sentences. Grant that, sustained by your grace, we may cast no one aside. Save us from slanders and lies. and to accompany them on their journey. that they may always render sentences that are just and true. Amen. Jesus himself bore our sins in his body on the cross, so that, free from sin, we might live for righteousness; by his wounds you have been healed. For you were going astray like sheep, but now you have returned to the shepherd and guardian of your souls (1 Pet 2:24-25). The wood of the cross is heavy, for on it Jesus bears the sins of us all. He staggers under that burden, too great for one man alone (Jn 19:17). It is also the burden of all those wrongs which created the economic crisis and its grave social consequences: job insecurity, unemployment, dismissals, an economy that rules rather than serves, financial speculation, suicide among business owners, corruption and usury, the loss of local industry. This is the cross which weighs upon the world of labour, the injustice shouldered by workers. Jesus shoulders it himself and teaches us to reject injustice and to learn, with his help, to build bridges of solidarity and of hope, lest we be like sheep who have lost our way amid this crisis. Let us return, then, to Christ, the shepherd and guardian of our souls. Let us strive, side by side, to provide work, to overcome our fears and our isolation, to recover a respect for political life and to work to resolve our problems together. The cross will become lighter if carried with Jesus, and if all of us lift it together, for “by his wounds – which are now windows opening to his heart – we have been healed” (cf. 1 Pet 2:24). our night grows ever darker! Poverty increases and becomes destitution. We have no bread to give our children and our nets are empty. Our future is uncertain. Provide the work we need. but lived in dignity! Amen. It is a frail, utterly human Jesus whom we contemplate in wonder in this most sorrowful station. Yet it is precisely by falling that he shows ever more fully his infinite love. He is hemmed in by the crowd, dazed by the screaming of the soldiers, smarting from the wounds inflicted at his flogging, grief-stricken at the depths of human ingratitude. And so he falls. He falls to the ground. But in this fall, crushed by the weight of the cross and sheer fatigue, Jesus once more becomes the Teacher of life. He teaches us to accept our weaknesses, not to be disheartened by our failures, and frankly to acknowledge our limits: I can will what is right – says Saint Paul – but I cannot do it(Rom 7:18). With the inner strength which comes to him from the Father, Jesus also helps us to accept the failings of others; to show mercy to the fallen and concern for those who are wavering. And he gives us the strength not to shut the door to those who knock and ask us for asylum, dignity and a homeland. In the awareness of our own weakness, we will embrace the vulnerability of immigrants, and help them to find security and hope. For it is in the dirty water of the basin in the Upper Room, that is, in our own weakness, that we see reflected the true face of our God! For “every spirit that confesses that Jesus Christ has come in the flesh is from God” (1 Jn 4:2). you humbled yourself to redeem our weaknesses. with the poorest of our brothers and sisters. for she is truly the mother of all! Amen. Simeon blessed them and said to his mother Mary: “This child is destined for the falling and rising of many in Israel, and to be a sign that will be opposed – and a sword will pierce your own soul also” (Lk 2:34-35). Rejoice with those who rejoice, weep with those who weep. Live in harmony with one another” (Rom 12:15-16). This encounter of Jesus and Mary his mother is poignant and tearful. It expresses the invincible strength of that maternal love which overcomes all obstacles and always finds a way. But even more powerful is Mary’s gaze of compassion as she sympathizes with and comforts her Son. Our own hearts are full of wonder as we contemplate the grandeur of Mary, who, although a creature, becomes a “neighbour” to her God and Lord. Mary’s gaze gathers up the tears shed by every mother for her distant children, for young people condemned to death, slaughtered or sent off to war, especially child soldiers. We hear in it the grief-stricken lament of mothers for their children who are dying of tumours caused by the burning of toxic waste. Tears of bitterness! Tears of solidarity with the suffering of their children! Mothers keeping watch by night, their lamps lit, anxious and worried for their young who lack prospects or who fall into the abyss of drugs or alcohol, especially on Saturday nights! At Mary’s side, we will never be a people of orphans! As with Juan Diego, Mary also offers us the caress of her maternal comfort and she tells us: Let not your heart be troubled… Am I not here who am your Mother?” (Apostolic Exhortation Evangelii Gaudium, 286). grant me your holy blessing. Bless me and all my family. in union with your merits and those of your most holy Son. placing it under your mantle. I may do nothing displeasing to God. They compelled a passer-by, who was coming in from the country, to carry his cross; it was Simon of Cyrene, the father of Alexander and Rufus (Mk 15:21). Simon of Cyrene just happened to be passing by. But it becomes a decisive moment in his life. He was returning from the fields. A working man, a strong man. And so he was forced to carry the cross of Jesus, condemned to a shameful death (cf. Phil 2:8). But this casual encounter leads to a life-changing decision to follow Jesus and to take up his cross each day in self-denial (cf. Mt 16:24-25). Mark tells us that Simon was the father of two Christians known to the community of Rome, Alexander and Rufus. A father who clearly impressed upon the hearts of his children the power of Jesus’ cross. Life, if you grasp it too tightly, decays and turns to dust. But if you give it away, it blossoms and bears fruit, for you and for the entire community! Here is the real cure for that selfishness of ours which always lurks beneath the surface. Our relationship with others brings us healing and creates a mystic, contemplative fraternity capable of seeing the sacred grandeur of our neighbour, capable of finding God in everyone, capable too of putting up with life’s troubles by holding fast to the love of God. Only by opening my heart to divine love am I drawn to seek the happiness of others through the practice of charity: a night spent in hospital, an interest-free loan, a tear wiped away in the family, heartfelt generosity, farsighted commitment to the common good, a sharing of our bread and labour, the rejection of all jealousy and envy. Jesus himself tells us: “Just as you did it to one of the least of these, my brothers, you did it to me” (Mt 25:40). a shelter of love for all who thirst for you. Helping our brothers and sisters is the key to the door of Life. tirelessly persevering in our commitment to fraternity. Amen. “Come”, my heart says, “seek his face!” Your face; Lord, do I seek. Do not hide your face from me. Do not turn your servant away in anger, you who have been my help (Ps 27:8-9). Jesus drags himself along, gasping. Yet the radiance of his countenance is undiminished. No amount of abuse can dim his beauty. The spittle and the blows were unable to obscure it. His face appears as a burning bush which, the more it is buffeted, the more it radiates salvation. Silent tears fall from the Master’s eyes. He bears the burden of one forsaken. And yet Jesus advances, he does not stop, he does not turn back. He confronts affliction. He is distressed by the cruelty all around him, yet he knows that his dying will not be in vain! Jesus then halts before a woman who resolutely approaches him. It is Veronica, a true image of a woman’s tender love. we thought would stand by us on the day of our desolation! which you too unjustly endured. nor can we give, a modicum of solace. Amen. They surrounded me … They surrounded me like bees, they blazed like a fire of thorns; in the name of the Lord I cut them off! I was pushed hard, so that I was falling, but the Lord helped me. The Lord has punished me severely, but he did not give me over to death (Ps 118:11,12-13,18). Truly we see fulfilled in Jesus the ancient prophecies of the lowly and obedient Servant who takes upon himself all our history of sorrows. And so Jesus, prodded by the soldiers, stumbles, overcome by fatigue, surrounded by violence, utterly exhausted. Increasingly alone, amid the encircling gloom! His flesh is torn, his bones are weary. In him we glimpse the bitter experience of those locked in prisons of every sort, with all their inhumane contradictions. 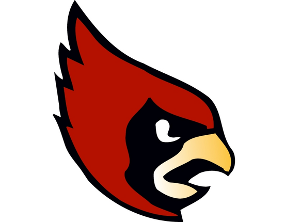 Confined and surrounded, “pushed hard” and “falling”. Prisons today continue to be set apart, overlooked, rejected by society. Marked by bureaucratic nightmares and justice delayed. Punishment is doubled by overcrowding: an aggravated penalty, an unjust affliction, one which consumes flesh and bone. Some – too many! – do not survive… And when one of our brothers and sisters is released, we still see them as “ex-convicts”, and we bar before them the doors of social and economic redemption. More serious is the practice of torture, which tragically is still practiced in different ways throughout our world. As it was in the case of Jesus, beaten, reviled by the soldiers, tortured with a crown of thorns, cruelly flogged. Today, as we contemplate this second fall, how truly do those words of Jesus ring: “I was in prison and you visited me” (Mt 25:36). In every prison, at the side of each person being tortured, Christ is always there, Christ who suffers, is imprisoned and tortured. Even in our greatest suffering, he helps us not to yield to fear. Only with help can those who fall rise again, aided by skilled personnel, sustained by the fraternal support of volunteers, and put on their feet by a society which takes responsibility for the many injustices which occur within the walls of our prisons. as I see you fall to the ground for my sake. yet you respond with such immense love! you have blessed us for ever. Blessed are we if today we join you in your fall, delivered from condemnation. and be reborn to new life as creatures destined for heaven. Amen. Daughters of Jerusalem, do not weep for me, but weep for yourselves and your children” (Lk23:28). Like so many tapers of light, we see women lining the path of pain. Women of fidelity and courage, neither intimidated by the soldiers nor cringing before the wounds of the Good Master. They are prepared to approach him and to comfort him. Jesus stands there before them. Others trample on him as he falls exhausted to the ground. But the women are there, ready to give him the warmth of a loving heart. First they gaze at him from afar, but then they draw near, as would any friend, any brother or sister, who realizes that someone whom they love is in trouble. Jesus is moved by their bitter lament, yet he tells them not to be disheartened by his sufferings; he tells them to be women not of grief but of faith! He asks for their solidarity in suffering, not merely a barren and plaintive sympathy. No more wailing, but a resolve to be reborn, to look to the future, to advance with faith and hope towards that dawn which will break even more radiantly upon those who journey with their eyes fixed on God. Let us weep for ourselves if we do not yet believe in Jesus, who proclaimed the kingdom of salvation. Let us weep for the sins we have not confessed. Then too, let us weep for those men who vent on women all their pent-up violence. Let us weep for women enslaved by fear and exploitation. But it is not enough to beat our breast and to feel compassion. Jesus demands more. Women need to be given reassurance, following his example; they need to be cherished as an inviolable gift for all humanity. So that our children may grow in dignity and hope. stay the hand of those who strike women! when they are victims of violence. above and beyond mere compassion. Make us a means of true liberation. Amen. Who will separate us from the love of Christ? Will hardship, or distress, or persecution, or famine, or nakedness, or peril, or sword?… No, in all these things we are more than conquerors through him who loved us!” (Rom 8:35,37). Saint Paul lists all his sufferings, yet he knows that Jesus was there before him: Jesus, who on the way to Golgotha fell once, twice, three times. Overwhelmed by hardship, persecution, the sword; weighed down by the wood of the cross. Drained! He seems to say, as we do, in our darkest moments: I can’t take it any more! It is the cry of those persecuted, the dying, the terminally ill, those who strain under the yoke. But in Jesus we also see strength: “Although he causes grief, he will have compassion” (Lam3:32). He shows us that in affliction, his consolation is always present, a “surplus” to be glimpsed in hope. Like the pruning which the heavenly Father, in his wisdom, performs on the branches that will bear fruit (cf. Jn 15:8). Not to lop them off, but to make them bloom anew. Like a mother in labour: in pain, she cries out, she endures the pangs of childbirth. Yet she knows that they are the pangs of new life, of spring flowers blossoming on branches recently pruned. May our contemplation of Jesus, who falls yet rises once more, help us to overcome the kinds of narrowness which fear of the future impresses on our hearts, especially at this time of crisis. Let us leave behind our unhealthy nostalgia for the past, our complacency and our refusal to change, and the attitude that says: “But we’ve always done it this way!”. Jesus who stumbles and falls, but then rises, points us to a sure hope which, nourished by intense prayer, is born precisely at the moment of trial, not after or apart from it! We will be more than conquerors, because of his love! and grant them a seat of glory. for you alone enrich us by your poverty (cf. 1 Sam 2:4-8; 2 Cor 8:9). Amen. When the soldiers had crucified Jesus, they took his clothes and divided them into four parts, one for each soldier. They also took his tunic; now the tunic was seamless, woven in one piece from the top. So they said to one another: “Let us not tear it, but cast lots for it to see who will get it”. This was to fulfil what the Scripture says: “They divided my clothes among themselves, and for my tunic they cast lots”. And that is what the soldiers did (Jn 19:23-24). They didn’t leave even a patch of cloth to cover Jesus’ body. They stripped him naked. He was without his cloak, his tunic, any garment whatsoever. They stripped him as an act of utter humiliation. He was covered only by the blood which flowed from his gaping wounds. The tunic remained intact, a symbol of the Church’s unity, a unity found in patient journeying, in a peace that is crafted, in a tapestry woven with the golden threads of fraternity, in reconciliation and in mutual forgiveness. In Jesus, innocent, stripped and tortured, we see the outraged dignity of all the innocent, especially the little ones. God did not prevent his naked body from being exposed on the cross. He did this in order to redeem every abuse wrongly concealed, and to show that he, God, is irrevocably and unreservedly on the side of victims. cleanse us of our uncleanness and our idols. which damage the credibility of your Church. and readily observe your laws. Amen. And they crucified him, and divided his clothes among them, casting lots to decide what each should take. It was nine o’clock in the morning when they crucified him. The inscription of the charge against him read: “The King of the Jews”. And with him they crucified two thieves, one on his right and one on his left. And the Scripture was fulfilled that says: “And he was counted among the lawless” (Mk 15:24-28). And they crucified him! The punishment reserved for the despicable, for traitors and rebellious slaves. This is the punishment meted out to our Lord Jesus: coarse nails, spasms of pain, the anguish of his mother, the shame of being associated with two thieves, his garments divided like spoils among the soldiers, the cruel jeers of passers-by: “He saved others; he cannot save himself. Let him come down from the cross now, and we will believe in him!” (Mt 27:42). And they crucified him! Jesus does not come down, he does not leave the cross. He stays there, obedient to the Father’s will to the very end. He loves and he forgives. Today many of our brothers and sisters, like Jesus, are nailed to a bed of pain, at hospital, in homes for the elderly, in our families. It is a time of hardship, with bitter days of solitude and even despair:“My God, my God, why have you forsaken me?” (Mt 27:46). May we never use our hands to inflict harm, but only to draw near, to comfort and to accompany the sick, raising them from their bed of pain. Sickness does not ask permission. It always comes unannounced. At times it upsets us, it narrows our horizons, it tests our hope. It is a bitter gall. Only if we find at our side someone able to listen to us, to remain close to us, to sit at our bedside… can sickness become a great school of wisdom, an encounter with God, who is ever patient. Whenever someone shares our infirmities out of love, even in the night of pain there dawns the paschal light of Christ, crucified and risen. What, in human terms, is a chastisement can become a redemptive oblation, for the good of our communities and our families. So it was for the saints. sit beside my bed of pain and keep me company. Do not leave me alone, stretch out your hand and lift me up! for I put my trust in your Love. Amen. After this, when Jesus knew that all was now finished, he said (in order to fulfil the Scripture): “I am thirsty”. A jar full of vinegar was standing there. So they put a sponge full of wine on a branch of hyssop and held it to his mouth. When Jesus had received the vinegar, he said: “It is finished”. Then he bowed his head and gave up his spirit” (Jn 19:28-30). Jesus’ seven last words on the cross are the perfection of hope. Slowly, with steps that are also our own, Jesus traverses all the darkness of night and abandons himself trustingly into the arms of his Father. It is the cry of the dying, the groan of the despairing, the entreaty of the lost. It is Jesus! “My God, my God, why have you forsaken me?” (Mt 27:46). It is the cry of Job, of everyone struck by misfortune. And God is silent. He is silent because his response is there, on the cross: Jesus himself, the eternal Word who out of love became man; he is God’s answer. “Remember me…” (Lk 23:42). The fraternal plea of the thief who became his companion in suffering, pierces Jesus’ heart; it is an echo of his own pain. And Jesus grants that request: “Today you will be with me in paradise” The pain of others always redeems us, since it draws us out of ourselves. “Woman, here is your son! …” (Jn 19:26). But it is his mother, Mary, who stood with John at the foot of the cross, who dispels all fear. She fills that scene with tenderness and hope. Jesus no longer feels alone. So it is with us, if beside our bed of pain there is someone who loves us! Faithfully. To the end. “I am thirsty” (Jn 19:28). Like the child who asks his mother for drink, like the patient burning with fever… Jesus’ thirst is the thirst of all those who yearn for life, freedom and justice. And it is the thirst of the one who is thirstiest of all: God, who, infinitely more than ourselves, thirsts for our salvation. “It is finished” (Jn 19:30). Everything: every word, every action, every prophecy, every moment of Jesus’ life. The tapestry is complete. The thousand colours of love now shine forth in beauty. Nothing is wasted. Nothing thrown away. Everything has become love. Everything completed for me and for you! And so, even dying becomes meaningful! “Father, forgive them; for they do not know what they are doing” (Lk 23:34). Now, heroically, Jesus emerges from the fear of death. For if we live freely in love, everything is life. Forgiveness renews, heals, transforms and comforts! It creates a new people. It ends wars. “Father, into your hands I commend my spirit” (Lk 23:46). No longer emptiness and anguish. But complete trust in the Father’s hands, complete repose in his heart. For in God, all the fragments at last come together to form a whole! we may bear the image of the heavenly man. When it was evening, there came a rich man from Arimathea, named Joseph, who was also a disciple of Jesus. He went to Pilate and asked for the body of Jesus; then Pilate ordered it to be given to him” (Mt 27:57-58). Before burial, Jesus is at last given back to his mother. She is the icon of a broken hearted, yet she tells us that death does not forbid a mother’s final kiss to her son. Bent over Jesus’ body, Mary is bound to him in a total embrace. This icon is known simply as Pietà – pity. It is heartrending, but it shows that death does not break the bond of love. For love is stronger than death! Pure love is the love that lasts. Evening has come. The battle is won. The bond of love has not been broken. Those who are prepared to sacrifice their life for Christ will find it. Transfigured, on the other side of death. Tears and blood mingle in this tragic embrace. So it is in the lives of our families whenever we suffer an unexpected and grievous loss, an emptiness and a pain which cannot be soothed, especially at the death of a child. “Pity” means being a neighbour to our brothers and sisters who grieve and cannot be consoled. It is great act of charity to care for those suffering from bodily wounds, from mental depression, from a despairing heart. To love to the very end is the supreme teaching which Jesus and Mary have left us. It is the daily fraternal mission of consolation which is entrusted to us in this faithful embrace of the dead Jesus and his sorrowful Mother. the saving victim of your Son Jesus. may never dim our hope of life beyond death. Amen. Now there was a garden in the place where he was crucified, and in the garden there was a new tomb in which no one had ever been laid. They laid Jesus there (Jn 19:41-42). That garden, with the tomb in which Jesus was buried, makes us think of another garden: the garden of Eden. A garden which through disobedience lost its beauty and became a wilderness, a place of death where once there was life. The overgrown branches which block us from savouring the fragrance of God’s will – our attachment to money, our pride, our squandering of human lives – must now be trimmed back and grafted onto the wood of the Cross. This is the new garden: the cross planted upon the earth! From on high, Jesus will now bring everything back to life. After his return from the pit of hell, where Satan had imprisoned so many souls, the renewal of all things will begin. His tomb represents the end of the old man. With as Jesus, God has not allowed his children to be punished by a relentless death. In the death of Christ all the thrones of evil, built on greed and hardness of heart, are toppled. Death disarms us; it makes us realize that we are subject here on earth to a life that will come to an end. And yet, before the body of Jesus, laid in the tomb, we come to realize who we really are. Creatures who, in order to escape death, need their Creator. The silence which fills that garden enables us to hear the whisper of a gentle breeze: “I am the Living One and I am with you” (cf. Ex 3:14). The curtain of the temple is torn in two. At last we see our Lord’s face. And we know fully his name: mercy and faithfulness. We will never be confounded, even in the face of death, for the Son of God was free among the dead (cf. Ps 88:6 Vg.). Protect me, God: for in you I take refuge. I keep you ever before me, for you are my God. You stand at my right hand; I shall not waver. or let your servant go down into the pit. happiness for ever at your right hand. Amen. In the Christian West few pious practices are as loved as the Way of the Cross, a devotion which recalls with mindful affection the last stage of the journey that Jesus walked in his earthly life: from when he and his disciples, « after psalms had been sung, left for the Mount of Olives» (Mk 14, 26), until the Lord was taken to the « place called Golgotha, The Skull » (Mk 15, 22), to be crucified and then buried in a garden nearby, in a new tomb hewn out of the rock. The life of Jesus is a journey traced by the Spirit: at the beginning of the mission the Spirit leads him into the desert (cf. Lk 4, 1); and then, as a divine fire burning in his breast, drives him to walk the way to Calvary (cf. Lk 12, 49-50). The last stage of the journey is unspeakably hard and painful. The evangelists lingered, although with moderation, over the description of the Way of the Cross which the Son of God and Son of man walked out of love for the Father and for humanity. Each step of Jesus is one step closer to the accomplishment of the plan of salvation: to the hour of universal forgiveness (cf. 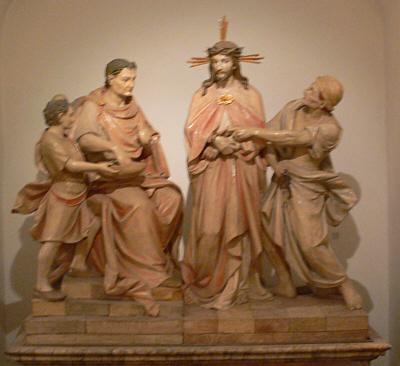 Lk 23, 34), the pierced Heart – the opening of an inextinguishable fountain of grace – (cf. Jn 19, 34), the immolation of the true Paschal Lamb, of whom not one bone will be broken (cf. Jn 19, 36), the gift of the Mother (cf. Jn 19, 26-27) and of the Spirit (cf. Mt 27, 50). Every new suffering of Jesus is a seed of future joy for humanity, every jeer, a premise of glory. Along that way of suffering Jesus’ every meeting – with friends, with enemies, with the indifferent – is a chance for one final lesson, one last look, one supreme offer of reconciliation and peace. The Church has always kept alive the memory of the words and the events of the last days of her Spouse and Lord, a loving although painful memory of the path Jesus walked from the Mount of Olives to the Mount of Calvary. The Church knows in fact that in every episode which happened on that Way lies hidden a mystery of grace, a gesture of his love for her. The Church is aware that in the Eucharist her Lord left her the objective, sacramental memory of the Body broken and the Blood shed on the hill of Golgotha. However she also loves the historical memory of the places where Christ suffered, the streets and the stones bathed in his sweat and in his blood. The Church in Jerusalem showed her love for the « holy places » very early on. Archaeological findings prove the existence of expressions of Christian worship in the burial grounds where the tomb used for Christ had been hewn out of the rock, as early as the second century. At the end of the fourth century a pilgrim woman named Aetheria tells us of three holy buildings on the hill of Golgotha: the Anastasis, the little church ad Crucem, and the great church – the Martyrium (cf.Peregrinatio Etheriae 30). And she describes a procession from the Anastasis to the Martyriumwhich took place on certain days. This was certainly not a Way of the Cross or a Via Dolorosa, nor was the via sacra, a sort of walking tour of the shrines in Jerusalem, alluded to in various chronicles written by pilgrims of the fifth and sixth centuries. However that procession, with its chanting of psalms and close connection with the places of the Passion, is considered by some scholars an embryonic form of the future Way of the Cross. Jerusalem is the city of the historical Way of the Cross. It is the only city with this great, tragic privilege. In the Middle Ages the attraction of the « holy places » gave rise to a desire to reproduce them locally: some pilgrims on returning from Jerusalem reproduced them in their own city. The Seven Churches of the Santo Stefano complex in Bologna are considered the most remarkable example of these « reproductions ». To a spirit of compassionate devotion for the mystery of the Passion we must add the enthusiasm aroused by the Crusades launched to regain possession of the Holy Sepulchre, a new flourishing of pilgrimages from the twelfth century onwards, and, from 1233, the stable presence of the Franciscan Friars minor in the Holy Places. 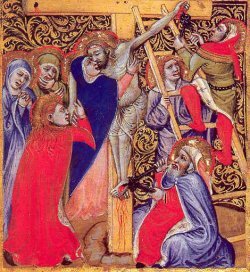 Towards the end of the thirteenth century we find mention of the Stations of the Cross, not yet as a pious practice, but as the path which Jesus walked on his way up to Mount Calvary marked by a series of « stations ». Around 1294 the Dominican friar Rinaldo de Monte Crucis, in his Liber peregrinationis, tells how he went up to the Holy Sepulchre «per viam, per quam ascendit Christus, baiulans sibi crucem », describing the different stations: Herod’s Palace, the Lithostratos, where Jesus was condemned to death, the place where Jesus met the women of Jerusalem, the place where Simon of Cyrene shouldered the Lord’s cross, and so forth. – devotion to the «the stations of Christ», to the moments when Jesus stops on his journey to the hill of Calvary either because he is forced to do so by his executioners or because he is exhausted from fatigue, or because, moved by love, he is still anxious to establish a dialogue with the men and the women who participate in his passion; often « sorrowful ways » and « stations » correspond in number and subject (each « way » concludes with a « station ») and the latter are marked with a column or a cross on which the scene, the subject of meditation, is at times depicted. In the long formation process of The Way of the Cross two elements should be noted: the fluctuation of the « First Station » and the variety of Stations. – The condemnation of Jesus in the Praetorium of Pilate, a rather early « First Station » which effectively marks the beginning of the final stage of Jesus’ sorrowful way: from the Praetorium to the Hill of Calvary. The subject of the stations also varied. In the fifteenth century great diversity in the choice, number and order of stations still prevailed. 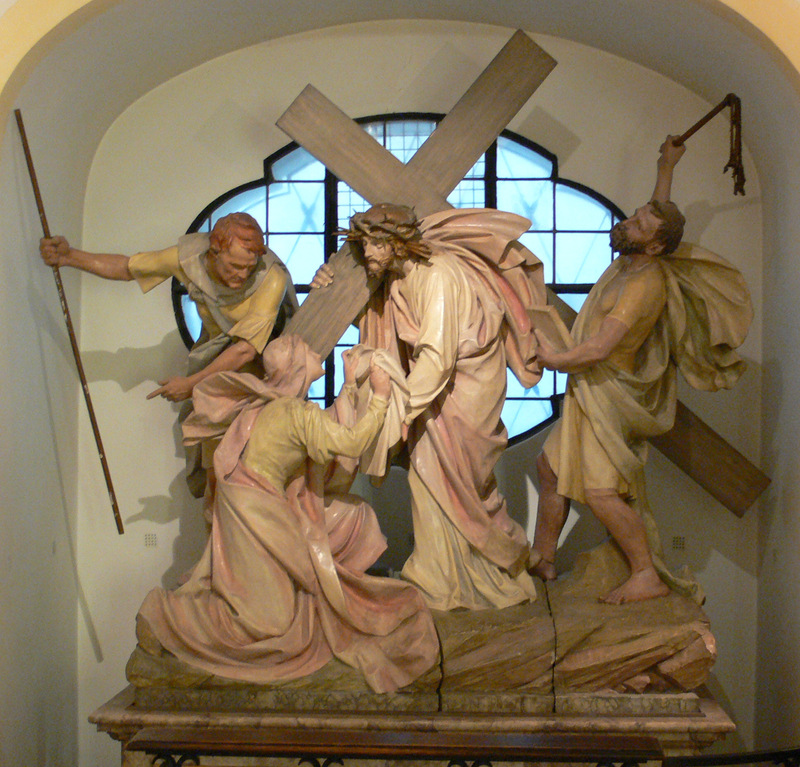 Some schemas of Way of the Cross include stations such as the capture of Jesus, Peter’s denial, the scourging at the pillar, the defamatory accusations at the house of Caiaphas, the mockery of the white robe at Herod’s palace, none of which are found in what was to become the textus receptus of the pious practice. Every year on the evening of Good Friday, the Holy Father goes to the Colosseum for the pious practice of the Way of the Cross, joined by thousands of pilgrims from all over the world. Compared with the traditional text, the biblical Way of the Cross celebrated by the Holy Father at the Colosseum for the first time in 1991 presented certain variants in the «subjects» of the stations. In the light of history, these variants, rather than new, are – if anything – simply rediscovered. 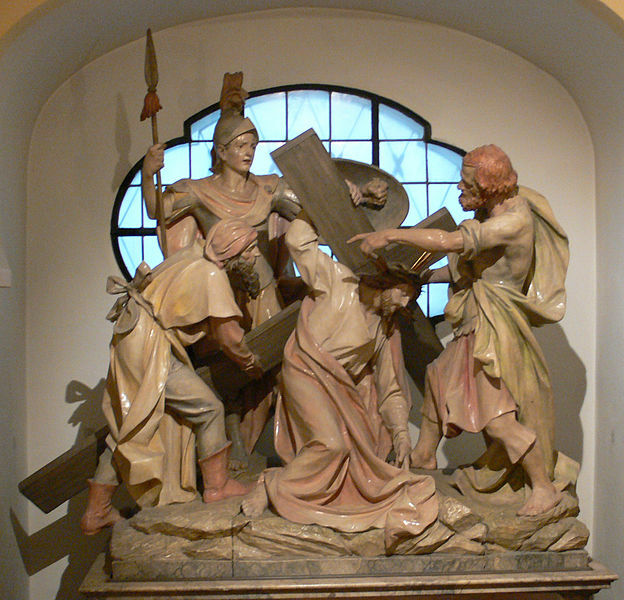 The biblical Way of the Cross omits stations which lack precise biblical reference such as the Lord’s three falls (III, V, VII), Jesus’ encounter with his Mother (IV) and with Veronica (VI). Instead we have stations such as Jesus’ agony in the Garden of Olives (I), the unjust sentence passed by Pilate (V), the promise of paradise to the Good Thief (XI), the presence of the Mother and the Disciple at the foot of the Cross (XIII). Clearly these episodes are of great salvific import and theological significance for the drama of Christ’s passion: an ever-present drama in which every man and woman, knowingly or unknowingly, plays a part. The proposal is not entirely new. Pilgrims arriving in Rome for the Jubilee of 1975 received a small handbook, Libro del pellegrino, prepared by the Central Committee for the Holy Year, which included an alternative version of the Stations of the Cross, with which in part, the 1991 biblical Via Crucis takes up. Likewise, the Congregation for Divine Worship on various occasions in recent years authorised the use of formulas alternative to the traditional text of the Way of the Cross. Master of the Liturgical Celebrations of the Supreme Pontiff. 12th Station of the Cross at St. Raphael’s Cathedral, Dubuque, Iowa. Christ has died for us and secured for us the possibility of eternal entry into the New Garden.